This lens is quite large and heavy, but features an attractive widest aperture and excellent build quality. Unfortunately, as with all silver star-lenses, the silver paint is quite easy to scratch. If you need the f/2 aperture, this is your only choice from Pentax. The opinions on this lens differ quite widely. Some are very satisfied with its performance and happy about its widest aperture, others are less enthusiastic. All agree that the lens is very sharp at narrow apertures, but some complain about poor corner sharpness at wide apertures. 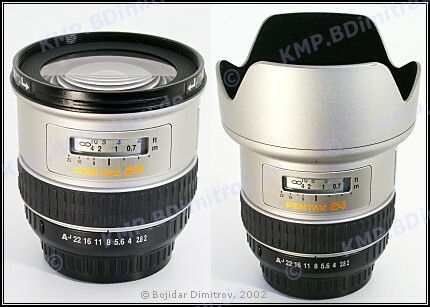 Since there exists 24/2.8, the most important reason to get this lens is its f/2.0 aperture. But if it is not that good at f/2.0, why should get it in the first place? In addition some say that this lens performs less well on digital bodies as with film, in particular with respect to cromatic aberation. Apparently geometric distortion is also not that great, but this should be less of an issue with cropped digital sensors.